The Melbourne Bicycle User Group has developed a vision for improving cycling and pedestrian access along St Kilda Road. Construct a Swanston Street style tram stop joining Federation Square to Flinders Street station. The existing stop between the State Library and Melbourne Central is already operating successfully, and two more of these stops are under construction at Bourke Street and at Collins Street. On Princes Bridge, bicycles would continue next to the trams, using what are currently the inner traffic lanes, while the outer lanes, next to the footpaths on either side, would be used only by taxis, accessing a rank on the bridge near Flinders St Station. Taxis would take a U-turn at the top of the bridge next to the existing pedestrian crossing and exit to the south. Outside the Arts Centre would be a pick-up and drop-off area (kiss-and-ride) for private cars, taxis and buses. Bikes would continue alongside the trams, with minor modifications to the existing layout. All vehicles except for taxis would U-turn at the existing pedestrian crossing at the southern end of Princes Bridge. South from Southbank Boulevard, a wide central median would be created, joining the existing tree lined medians, creating green open space and room for a two-way bike path. Bikes would be well away from motor traffic and all road crossings are already controlled with turning arrows, so bikes would cross alongside trams, totally protected. 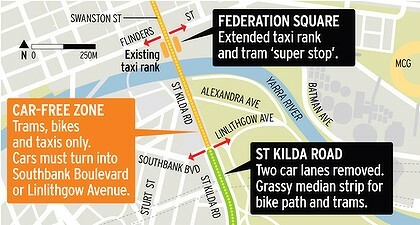 Accessing destinations in St Kilda Road, and turning off to side roads would be via traffic lights at intersections.